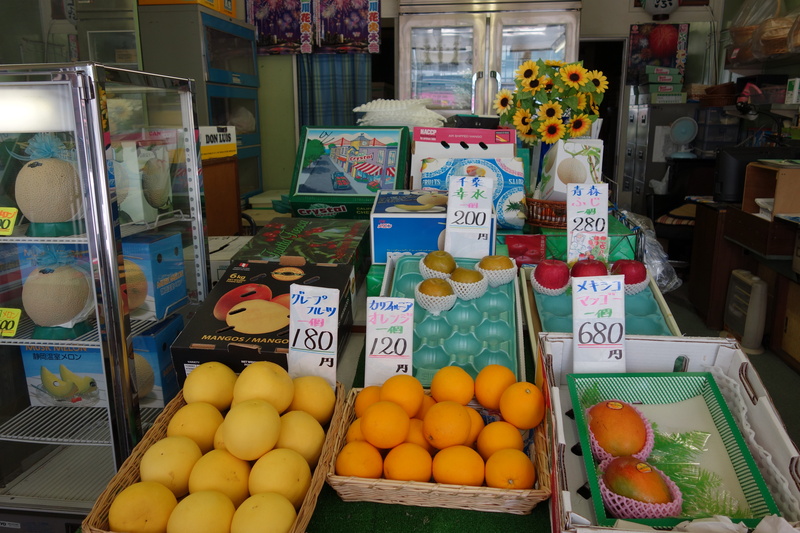 Hiromi Sato of Ishii Fruits tells you her one-word business strategy. She takes a scrap of paper and writes it down. 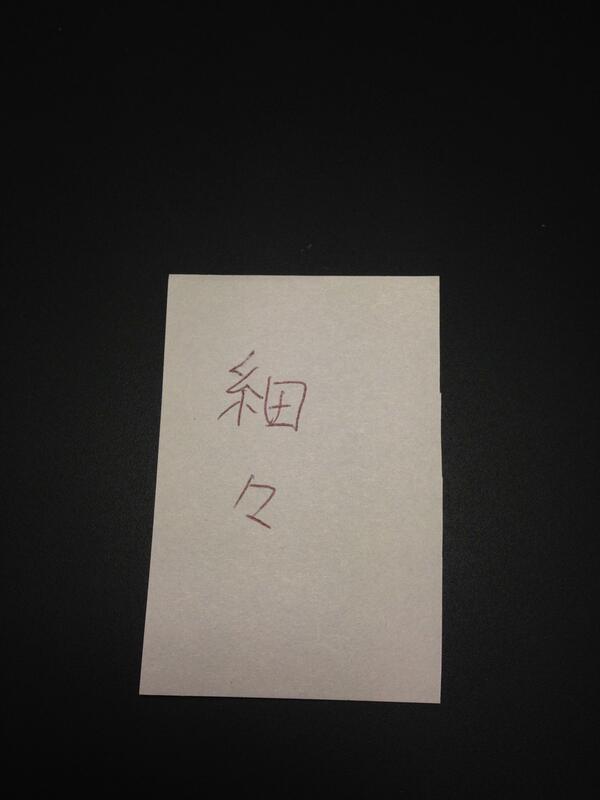 It’s the Chinese character for thin, repeated. So: thin, thin. You read it hosoboso. It means, just scraping by. She laughs about this. 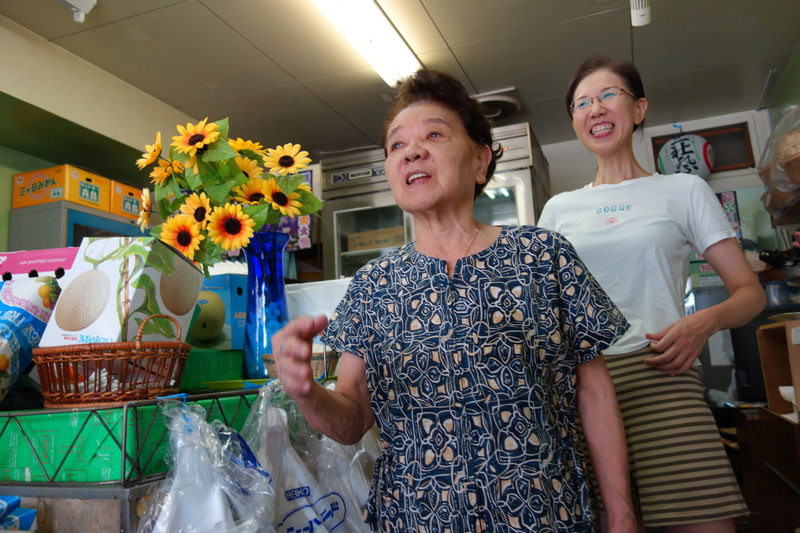 The next day you’re passing the store nearby Tawaramachi station and you think you might be able to meet her 84-year-old mum on her morning shift. Hiromi says, Oh she just went for a nap, she’s very fit but I think this heat is about the limit. I’ll call her. When mum Eiko appears from out the back, she does indeed have a twinkle in the eye and, you suspect, a core of steel. You don’t see her collapsing in any heatwave. She tells you, You know we have a way of doing business … but you already know the punchline. Hiromi says living by hosoboso means not to keep stock, or expand unnecessarily. She doesn’t bother with thinking about ways to please a changing clientele since her father died 7 years ago. But she notices differences. She says, Young people want fruit you don’t have to skin, like mandarins. Older people don’t mind peeling nashi, or apples. Western travelers stop in every day. 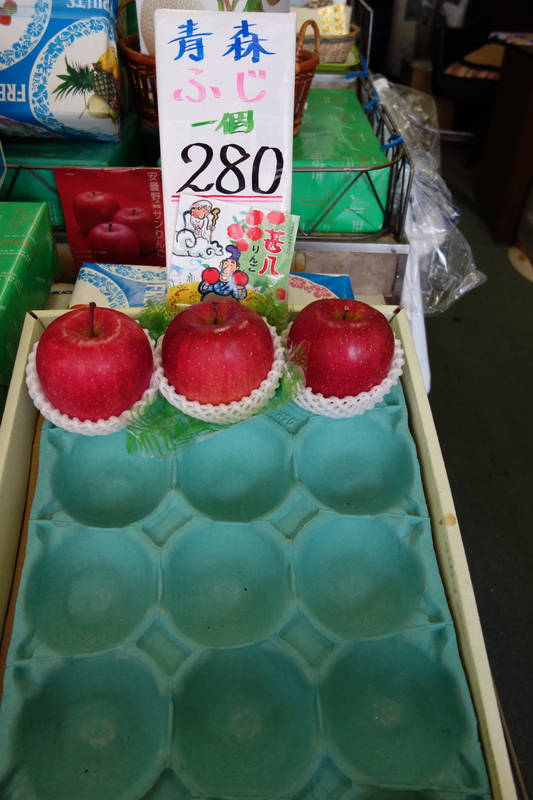 They buy the dried fruit, Turkish apricots, American blueberries, or just a nashi or apple. They’re heading to the Asakusa View Hotel, or one of the backpacker hostels. If they have any queries, Hiromi likes to give directions. It’s because I enjoy travel, she says, so I like to hear where they’re from. I’ve only been to Hawaii and Australia, but I used to go on shiseki meguri, temple pilgrimages around Japan. Though I can’t do that now with the shop. I like to see things for the first time. They can be hit or miss. About one out of 20 will be dark inside, but how can I tell without cutting them all open? You notice there’s not actually much fruit here. 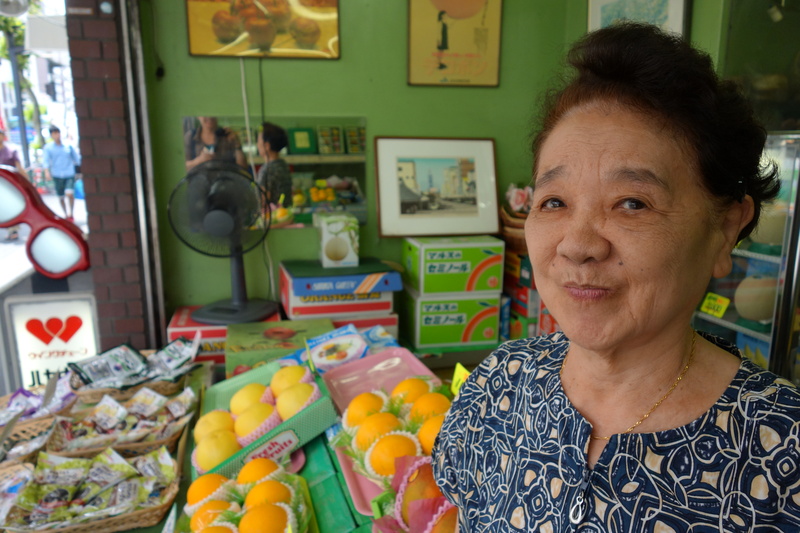 She says that’s because the Ota wholesale market is closed for O-bon. 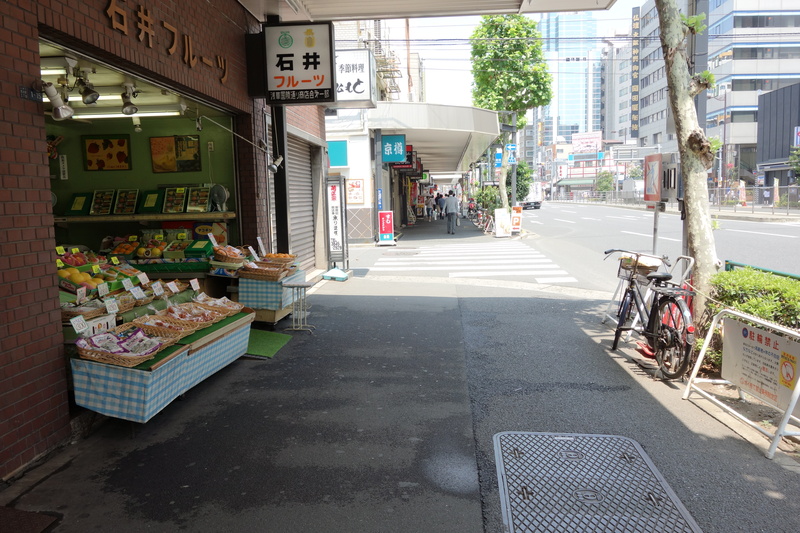 And after what’s out on the low tables is sold, today or tomorrow, Ishii Fruits will close for four days to take their turn at a holiday. They’ve stayed open through everyone else’s break, because the many local temples order fruit, and it’s the season for people to come to family graves. The shopfront is like a garage, everything’s open to the street. Four electric fans oscillate in the corners. There’s no aircon. 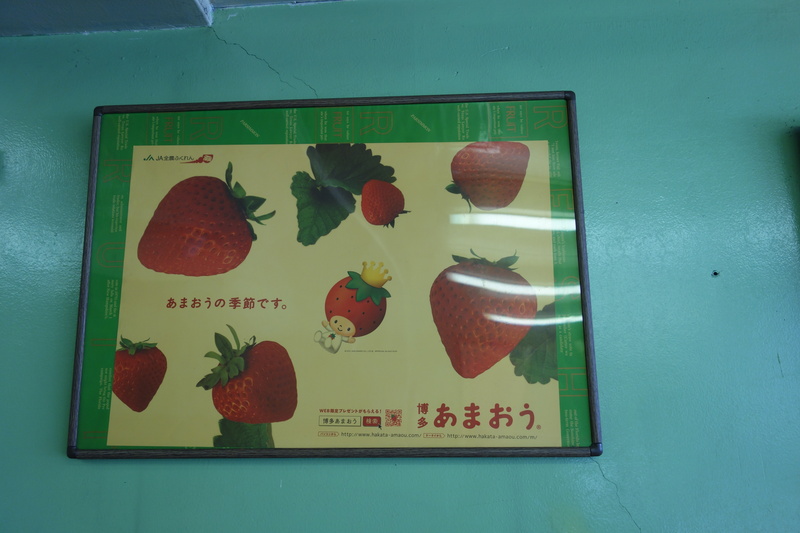 Posters promoting cherries, strawberries and other fruits are framed on the green walls. 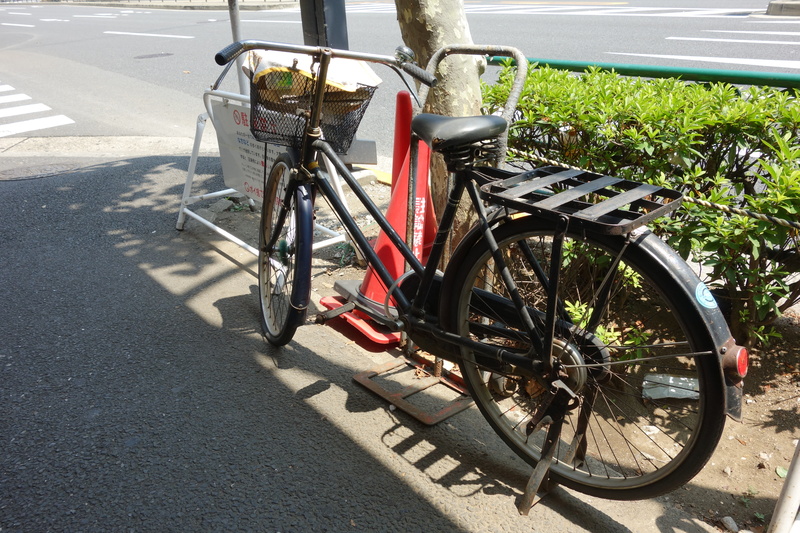 Dad’s black delivery bicycle stands outside. Hiromi says she still uses it to make temple deliveries. The tyres could use some air. Gift baskets line the shelf above a wrapping station provided with ribbons. 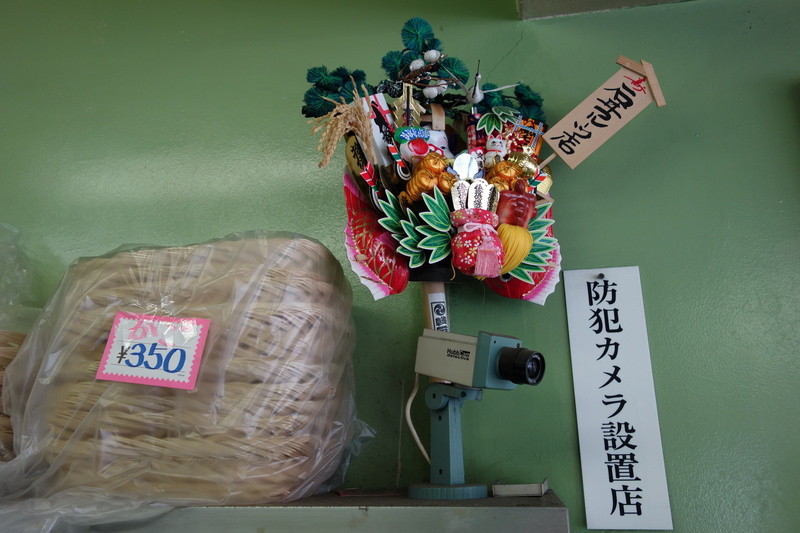 There’s a kumade decorative bamboo rake, renewed yearly at the Asakusa Tori no Ichi fair. It’s what you buy for the gods of commerce. Each new one is meant to be fancier than the last. You may want a little help from the cosmos when you live by hosoboso. The best part of the job, says Hiromi, is when customers enjoy my fruit. You say the Fuji apple she sold you yesterday was extraordinarily good. She says she is very glad, because it was six months old. Her wholesaler keeps them in a polystyrene box through the off season. She says, They can be hit or miss. About one out of 20 will be dark inside, but how can I tell without cutting them all open? If it was no good I’d have given you another one. She says to look forward to the Tsugaru apples coming soon. Also huge purple Kyoho grapes from Nagano. Somehow you think all the apples she sells are probably pretty good, or if there’s a disappointment, it’s instantly resolved. Something about her in-the-moment ease, and the weight of 60 years in the business starting with her grandfather, who was originally a barber in this same shop, before making the change to fruit. She cools the footpath from a plastic watering can. She says, I do this about 20 times a day in this weather. As soon as it dries out, I do it again. She laughs. You have to splash water around, she says, because we have the expression, fruits are mizu-gashi – they’re water candy.